For my experiments with wireless energy transfer, instead of the Tesla Coil, I have used a similar circuit called Slayer Exciter. This is a particularly good choice if a device with less power is required. Similar to the Tesla coil, the Slayer Exciter generates a high-frequency high voltages. The Slayer Exciter was a brainstorm of Dr. Stiffler and Gbluer. It is very simple and inexpensive to produce. To maximize the power, I used two Slayer Exciters (Double Slayer Exciter) and performed slight modifications. Basically, Slayer Exciter is very simple oscillator. In the circuit are shown two Slayer Exciters (two oscillators). Transistor T1 of the first oscillator excites the primary coil Lp1. 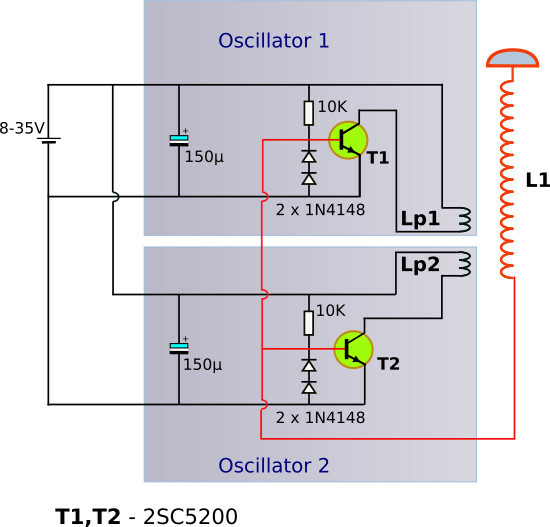 Transistor T2 of the second oscillator excites the primary coil Lp2. The primary coils (Lp1, Lp2) inductively excite the secondary coil L2. The bases of transistors T1 and T2 are directly connected to one end of the secondary coil L1. As a result, the transistors operate automatically at the resonant frequency of the coil L1. The primary coils (Lp1, Lp2) and the secondary coil L1 are wound in the same direction. They are wound parallel to each other on a PVC tube 3” (7.5cm) diameter. Each has 5 turns of 9AWG wire (2.9mm). The secondary coil L1 has approximately 800 turns of 25 AWG (0.45mm) magnet wire on a PVC tube 2” (5cm) diameter. To prevent greater heating of one of the transistors, transistors must have approximately the same characteristics. The resonant frequency of the coil L2 will be a significant change, if you are changing the distance (d) between L1 and L2. The reason are primarily due to the mutual capacity between L1 and L2 (CT12 +CL12). 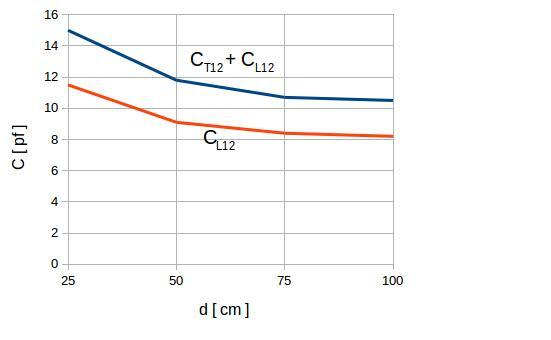 CL12 – mutual capacitance between the coils L1 and L2 (without top load). 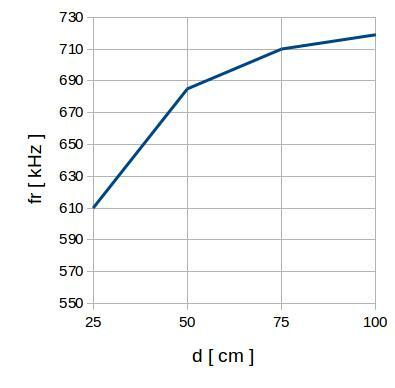 The device operates at a frequency around 600-700 kHz, depending on the distance (d). Coupling between the two coils (L1 and L2) is primarily by electric field (Resonant Capacitive Coupling – electrostatic induction). In this case (Tesla coils) inductive coupling is negligible. Obviously, electric fields are far more effective than magnetic fields towards coupling energy between widely spaced resonant coils. The coils L1 and L2 have the same inductance – 4.7mH. The phase shift between the voltage of the coil L1 and the voltage of the coil L2 is about 180°. Electric field E1 around the coil L1 and electric field E2 around the coil L2 are opposite polarized and act against each other. question , what is the output voltage on the receiver if I use 24v to the transmitter ? I can not tell you exactly because it depends on the distance between the coils L1 and L2 and the applied consumer (bulb). In any case the device works well and at 24V. For the experiments would be good to use an incandescent bulb 15W 230V or 230V 25W. looking at the video on article 2 , I can only see 2 wires coming from the primary back to the board. ( one on the bottom & one at the top . Thank you, if you buy the application (2$). In this way, you support my work. Wonderful work. I've purchased your application, but somehow there's a problem in accessing the third, and fourth part which are the Two-coil Power Transfer, and Three-coil Power Transfer. Hope you can help with it. Two-Coil Power Transfer, and Three-coil Power Transfer. However in the meantime I've described on the page. I will soon include these elements in the new update. Sir, there is a confision in patching the circuit on the veroboard. We are unable to understand that base of the transisters are only connected to the coil L1 or it is connected to the coil as well as with the junction of diodes and resistor.We need your guidance .Circuit is also attached with this mail. Sir this application is not available to be purchased in Pakistan I tried it often. I have have a confusion that the direction of winding of L1 and L2 are same or not? L1 and L2 can be wound in the same direction but may be also wound in the opposite direction. It is important that they have the same number of windings. REALLY nteresting experiments ! What is not clear to me yet is how do you know that it is resonance transferring power to the second coil and not RF in other words it is not clear the quarter wave lenght role. What if you use any other lenght of receiver-coil instead? REALLY A GREAT and inspiring WORK! Thank You for sharing ! Thank you. Sorry for the Late Reply. It is a near field region. High voltage causes a strong electric field. 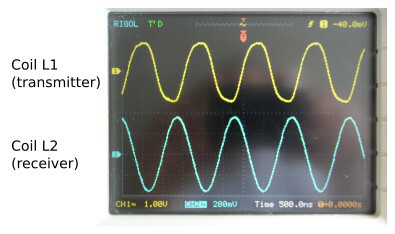 The electric field enables capacitive power transmission. The electrical field strength is visible on the coil as a quarter of a wave. The maximum electric field strength is at the top of the secondary coil and the minimum at the bottom. What impressive experiments, but, I have a confusion. In Basic Tesla's Experiments (Part 6) – Oscillating electric field and capacitive coupling, you use a light to test the oscillating E-field. I really want to redo your experiments, so could you please tell me what is the structure of testing light, what bulb did you use, did you use any compensation network to light the bulb. Just a bulb connected with two conductor? What is the length of each conductor? In the first part of the video I used a neon bulb. In the second part, I used an incandescent bulb directly connected to a conductor. The thickness of the wire and the length of the wire for one wire transfer of energy is not essential. I also tested a very thin wire of 0.08mm and a length of about 20m. The result is the same as with the thicker wire. I did not use any compensation network. The impedance of the used bulbs corresponds to the output impedance. More clear about impedance matching – Basic Tesla's Experiments (Part 5). Measuring Power Consumption – Basic Tesla's Experiments (Part 4). Could I please ask if you have a source for the 150uF capacitors? Can I vary the value and what voltage are they rated at? I hope you can help as I'd really like to build this version. Sorry for the late reply, I was away for a while. I used a 400V capacitor. No such high voltage is necessary, but it is safer if the voltage is higher. You can also take a smaller or larger capacitor of 150uF. Try with a cheaper transistor, for example, TIP51 ili TIP52 or some other. When all works well then 2sc5200. 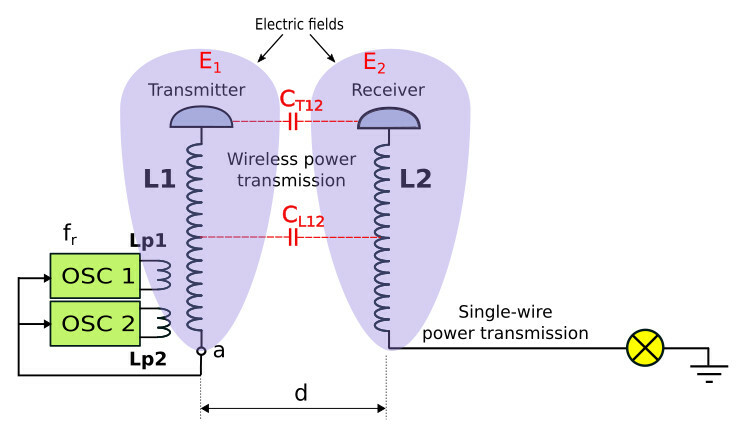 the transmitter coil (<1m), the current through the transistor is higher, therefore it would be good to limit the current from the rectifier. I hope this will help. What sample of transistor would you highly recommend ? Sorry for the late reply, I was away for a while. In experiments it is easy for the transistor to burn. Therefore, it must not be too expensive, it must be fast enough and powerful enough. As I have shown on the scheme a good choice is 2sc5200. do you have any computations on how you solve the frequency of the tesla? how did you measure the diameter of the pvc ? and how can you measure the voltage and current of the tesla ? how much input voltage did you use in that experiment ?